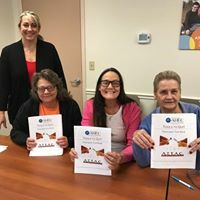 Northeast Florida AHEC in partnership with Tobacco Free Florida has made it a priority to provide tobacco cessation opportunities throughout the State, while training current and future healthcare professionals on how to assist tobacco-using patients. Get the support you need at one of our classes! Classes are held locally and taught by trained Tobacco Treatment Specialists. These classes provides tobacco users with the information, resources, and support they need to quit tobacco use. Click here to learn more about Tobacco Free Florida’s free resources and get more tools and tips to help you quit YOUR way. Northeast Florida AHEC works with various healthcare facilities to assist them in helping patients and staff quit using tobacco. By providing workshops and on-site trainings on tobacco-related topics, providers can develop effective ways of identifying and assisting tobacco users to become tobacco-free. In addition, we provide training and resources to college programs that prepare health-career students to effectively educate and assist their future patients. We strive to work in conjunction with many health care providers and other community partners to assist their patients in quitting tobacco. To refer a tobacco user, to one of our classes, please fill out the referral form and fax to the number provided. We will contact the client and get them registered in a class that is convenient for them.